Any town located on a great river deserves a route like this. 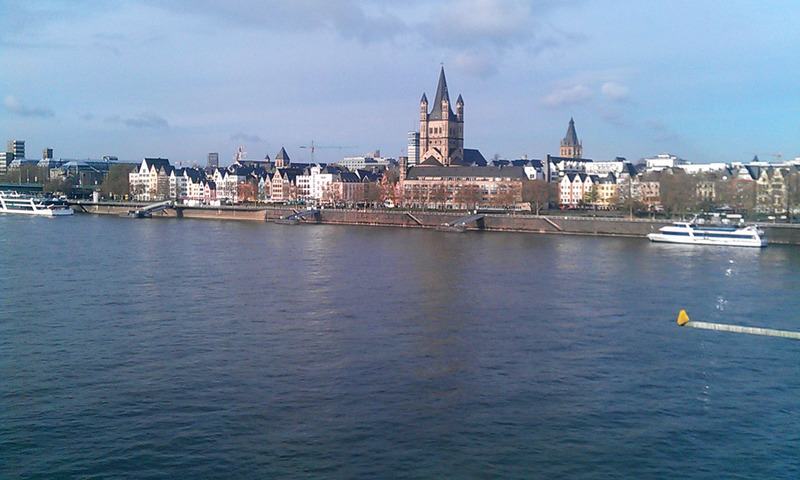 And Cologne (Köln) is on a really great river, the Rhine, bordered on each side by promenade walkways, with pedestrian lanes lining every bridge in town. If you want to head anywhere along the river, just run there, cross to the other side and then head back. You can't go wrong. 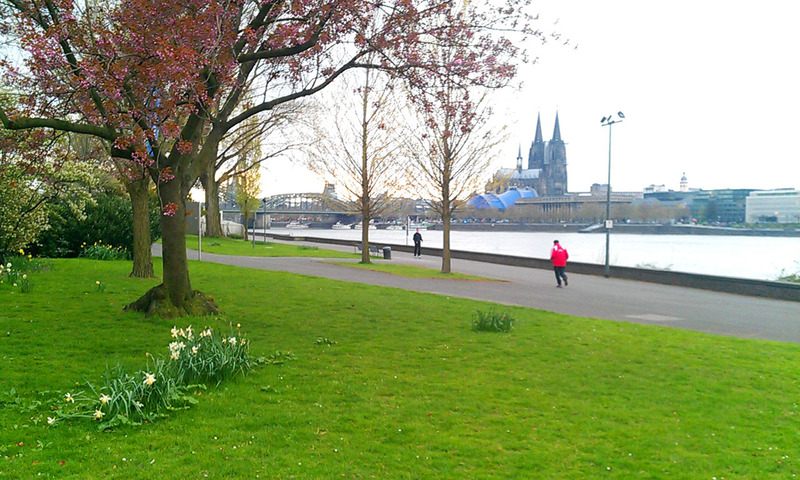 Here's a run that takes over where the Historic Köln Route ends: heading north along the river from the old town. It heads northwards for 3 kilometers to the Mühlheimer Brücke (bridge), crosses over, then heads back south again. We'll start in the heart of the old town in the small square in front of the Rathaus (town hall), Rathausplatz. 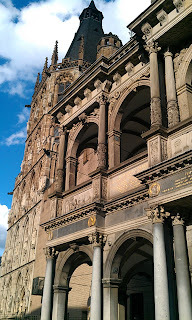 The town hall is a stylistic mix of romance- and gothic-sections, built over the ages. Facing the Rathaus, turn left to run north for one block along Bürgerstraße. At the first cross-street, Alter Markt, turn right and run past the market square, heading downhill, straight east to the river. This is a quiet old-town neighborhood around the St. Martin's churchyard. This was the heart of the original Roman town, Colonia Agrippina. At the river pedestrian promenade, turn left to head north. 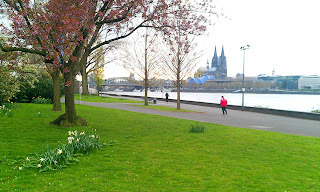 You'll pass the Köln Philharmonic and Modern Art Museum on the left, with the famous cathedral, the Dom, behind them. 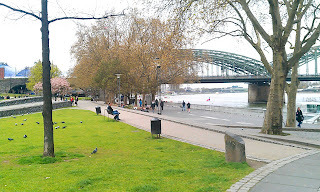 Next, you'll run under the railroad bridge that connects Köln to the north, beyond the Rhine. The promenade is full of runners, walkers, bicyclists and tourists, so you might need to weave your way through. We are heading north for 2 more bridges. First, after 1.5 km, you'll go under the Zoo bridge, with its ski-lift gondolas gliding past, up above. Right after the Zoo bridge, the path splits. You must either continue along the water on the dirt path, or stay behind the treeline to the left on the smooth, paved path. I like the dirt trail, right on the water, watching the river barges go by. 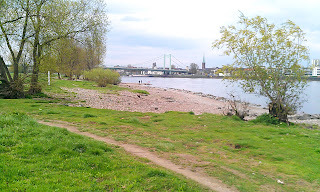 The waterside is lined with gravel- and sand-beaches, and an ever-widening meadow. 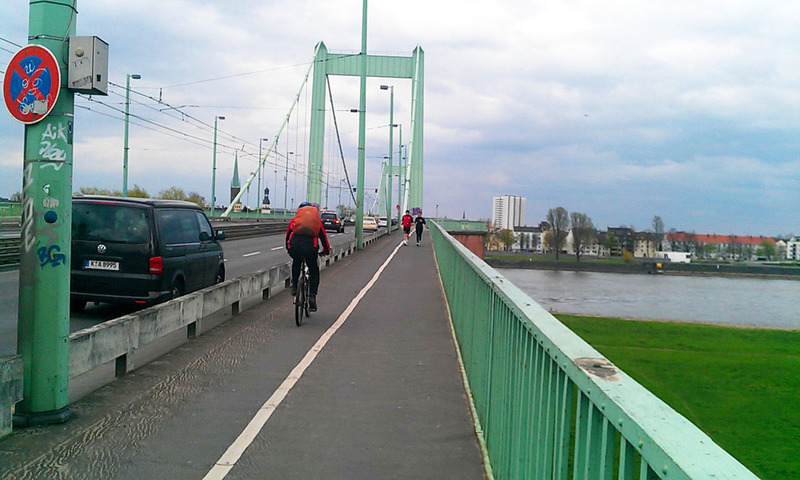 After almost the same distance again, you'll come to the Mühlheimer suspension bridge. Just before the bridge, take the path to the left that leads to the stairs going up to the bridge. Go up to the bridge and then follow it north across the river. When you are near the other side, look to your right and you'll see the modern, arched cement footbridge going from the north bank to an island in the river. We'll cross that bridge in just a few minutes. You are now at the half-way point, entering, you guessed it, Mühlheim. 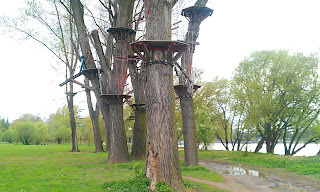 The first stairs back down on the east side of the river, in Mühlheim, is 100 meters past the riverside. So, when you go down the stairs, run back to the river and then start running southwards. But after just 200 meters, your path will be blocked by a sturdy metal fence. You will need to turn left and go around the next few houses along the river. 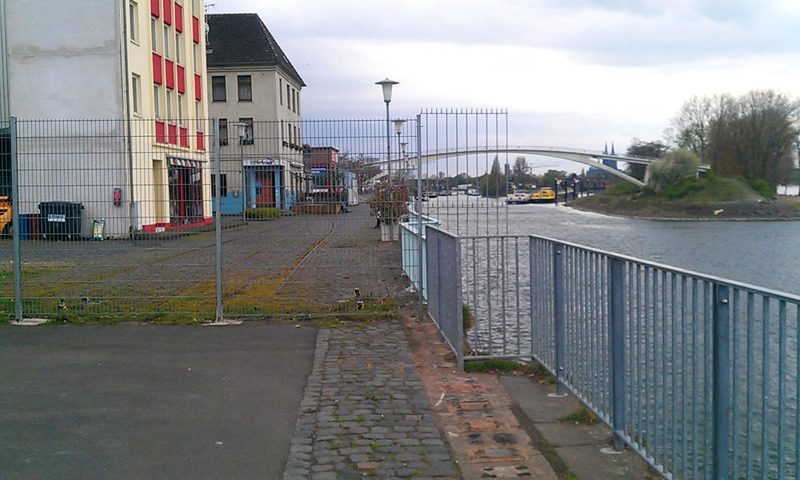 This little neighborhood is the filming location of the German TV soap-opera, Die Anrheiner. One block later, you'll see the pedestrian bridge to the island going off to the right. The bridge goes over a little beach bar, a great place to stop and hang out for awhile in the summer! On the other side of the bridge, you'll find yourself on a wooded, sandy peninsula: the island isn't really an island at all. Now, continue heading south along the waterside. 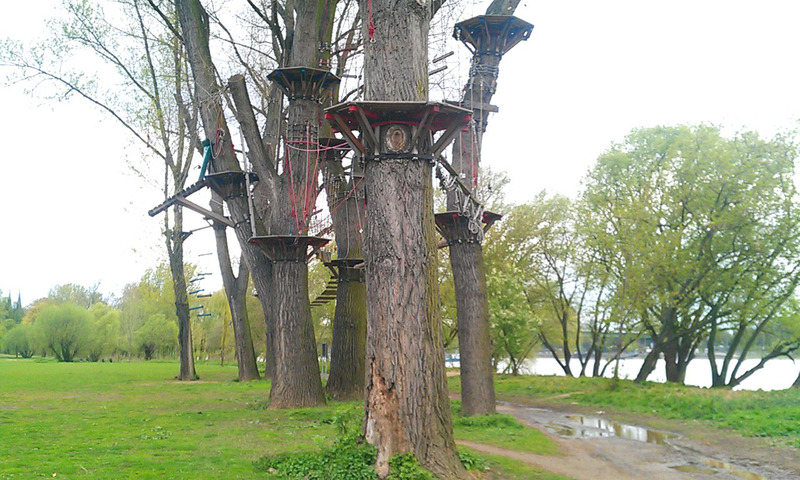 You'll soon pass Rope Island, a ropes course (Hochseilgarten) set up in the treetops. After going under the Zoo bridge again, the Rheinpark begins, with its soccer fields, playgrounds and gardens. 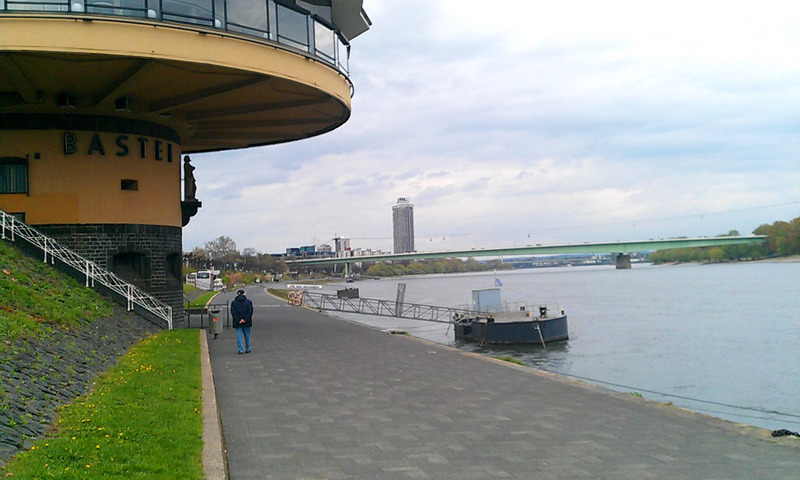 Before you get back to the railroad bridge, you pass the Köln Messe, the exhibition center, on the left and its art-deco exterior. But we won't cross back on the railroad bridge. We'll run the the next bridge, the Deutzer Brücke, so that we can run back through a different side of the old town. Cross the Deutzer Brücke and continue for 100 meters to the tram station, where you can turn right and run north through the Heumarkt market-square. 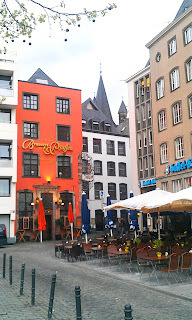 At the north end of the market, turn left and run the two blocks along Marsplatz back to the Rathausplatz. 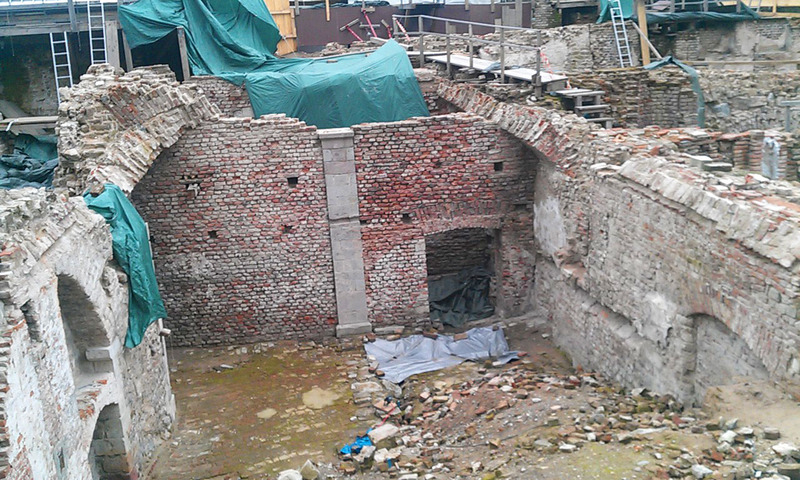 Most of the square is an archaeological dig, called the Archeological Zone, with ruins going back to the Roman days, and with a new Jewish Museum going up over the exposed cellars, including Northern Europe's oldest synagogue. Just turn right after the excavations and you will come right back to the front of the Rathaus again. Hey! I want to thank you for the route! 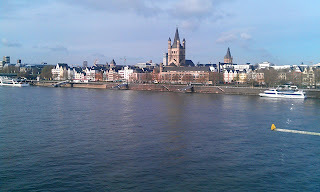 My first time in cologne. So glad to google out your post and followed your rount. I enjoyed th lovely tranquil early morning 7 miles. Back to your site and browsed a bit, wow... I am so impressed!!! Like you, I also jog wherever my work trips take me. And nothing better than exploring a new place on your two feet. Thank you for sharing and happy running! Thanks for the kind words! 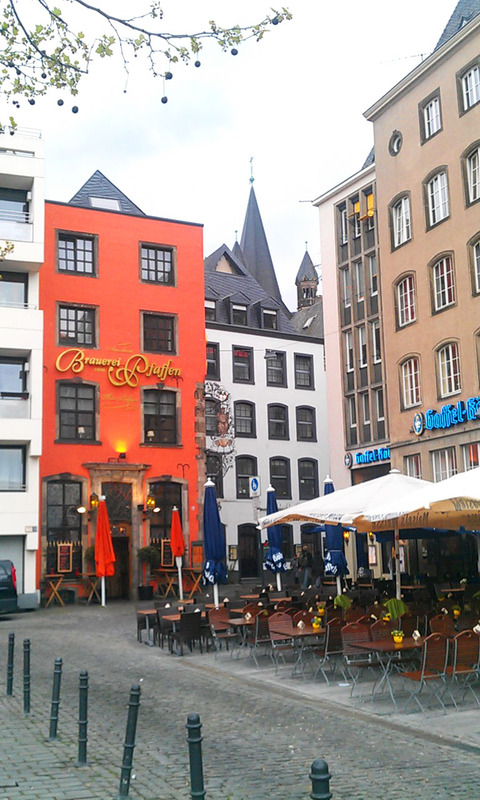 I'm off exploring a new route in Dublin at the moment ;-) Enjoy your stay in fun Cologne! I will try it tomorrow..
Am off to Cologne tomorrow for work, found this run which looks great, will let you know how it goes. Great site, thank you.